Does ‘John’ need your time or attention? He was referring to the production line office visit only style of consulting where the Doctor is under such time pressure that they’re interrupting their Patient within just 18 seconds before launching into a rehearsed speil like a needle dropping onto a spinning record in a desperate bid to turn around the Patient (without getting a compliant) within 5 minutes so they can rinse and repeat until the office doors are closed. 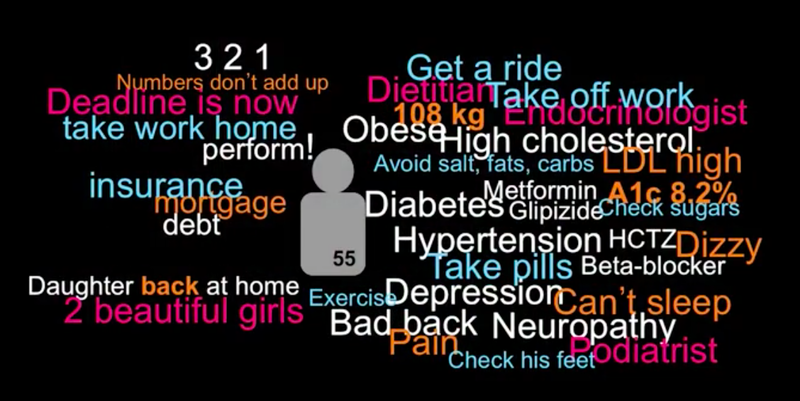 “…(11min) Meet John, John’s 55 years old, he has diabetes, he’s on metformin and glopizide, he also has hypertension and he’s been on a beta blocker and that was not sufficient to achieve the target blood pressure measures for quality so his Doctor promptly added a beta blocker and now everytime John stands up quickly he gets dizzy. He has high cholesterol, he has depression, he also has a bad back that hurts. He also has pain in his feet from neuropathy, he is obese. His Doctors told him that it’s time to go and see and endocrinologist – always a good idea, see a podiatrist for his feet and a dietitian and for that he has to go to a big medical centre so he will have to take some time off work and find someone to give him a ride. When he gets there he’s going to be told he has to quit the salt, quit the fat, quit the carbs, he’s going to be told to exercise which is of course very challenging given his bad back. He’ll be told to check his feet but John has a big belly and he hasn’t been in contact with his feet for a long time. He will be told to take his pills but of course he’s taking his pills otherwise how is he getting dizzy right? He’ll be told to check his sugars which he checks, he writes them down in a book, brings them to the Doctors office the Doctor reviews a little booklet with all the numbers and he gets a breeze on his face as he is moving through them and then he looks at that Hba1c as the only thing that matters and it’s 8.2% and that’s high. His LDL cholesterol is high. His weight is also high at 108kg and this is really what they’re talking about. He’s also in pain and he can’t sleep but that doesn’t come up in those conversations. The reason he can’t sleep is he used to be in a company where there were 3 accountants then 2 and now he is the only one in that capacity. That means he has to perform, he’s bringing the work home looking at things carefully and he’s realising that these numbers are not adding up and this company is going under and he’s going to have some serious difficulty with his financial obligations, insurance, debt and mortgage. The thing that bothers him most about home is not the mortgage it’s the fact that his older daughter has come back to live with him and she has brought with her two beautiful granddaughters and the reason they’ve moved in is because she was in an abusive relationship with her husband and they were doing drugs and alcohol and she was always wasted. And so he’s reflecting on the situation and the future of his grandkids and he opens up his mail and he gets a note from his primary care Doctor from his primary care office, indicating that because he’s not achieving the goals, the target controls for chronic disease he needs to go and find another primary care physician. So what’s up with John? Is he not taking personal responsibility? Do we need to ‘educate’ him? 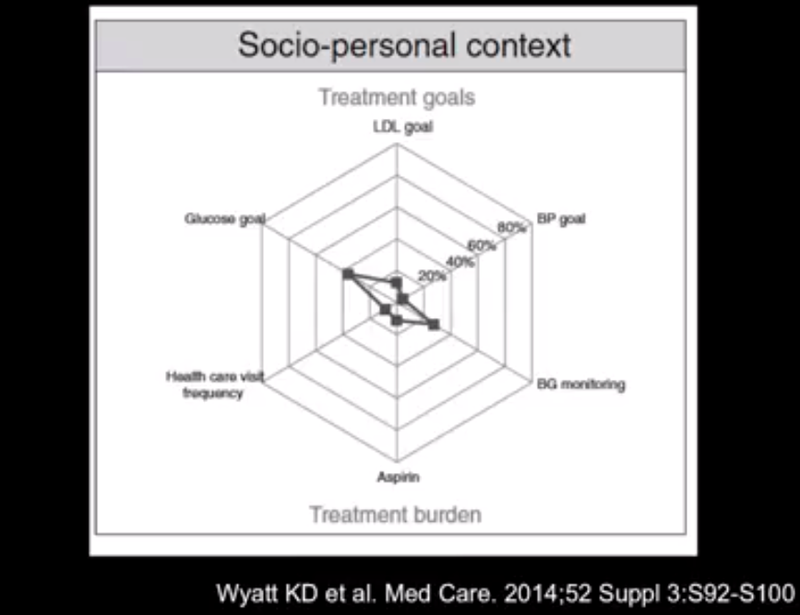 So I will put forward that the problem with John is that he has a complex life, he has a complex context and the healthcare program that he has does not fit and any reasonable clinician would want to collaborate with John to co-create a program that fits but we don’t live in that world anymore. We live in a world in which the only acceptable answer to a situation like John with a high Hba1c and a high blood pressure and a high cholesterol and a high weight is to intensify the treatment. If we don’t intensify the treatment we will be told we have ‘Clinical Inertia’ because we’re not intensifying the treatment. Am I crazy (saying this)? Well here’s a survey of Primary Care Clinicians and it’s getting a bit old and needs to be updated but most strikingly look at the last item. 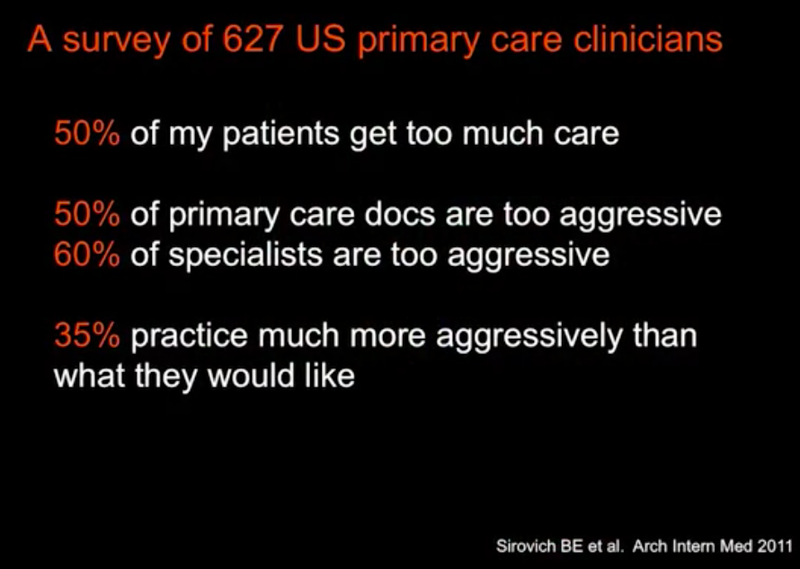 A third of primary care clinicians think that their own practice is too aggressive, more aggressive than they would like it to be. 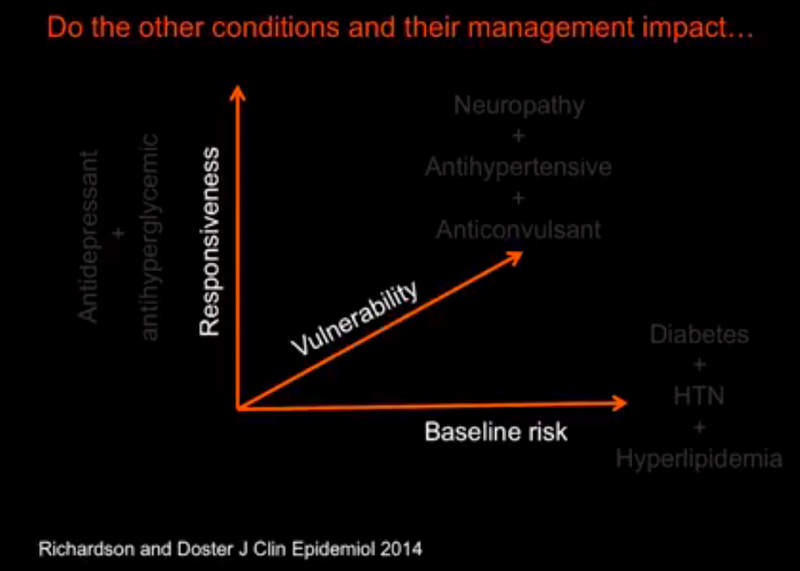 When I show this to Primary Care Clinicians I’m looking for nods, people go ‘yeah, yeah, yeah’. When I show it to Patients there’s panic because you see Patients realise they’re not in charge but they thought their Doctors were and the Doctors are now saying they’re not in charge. So who is in charge? 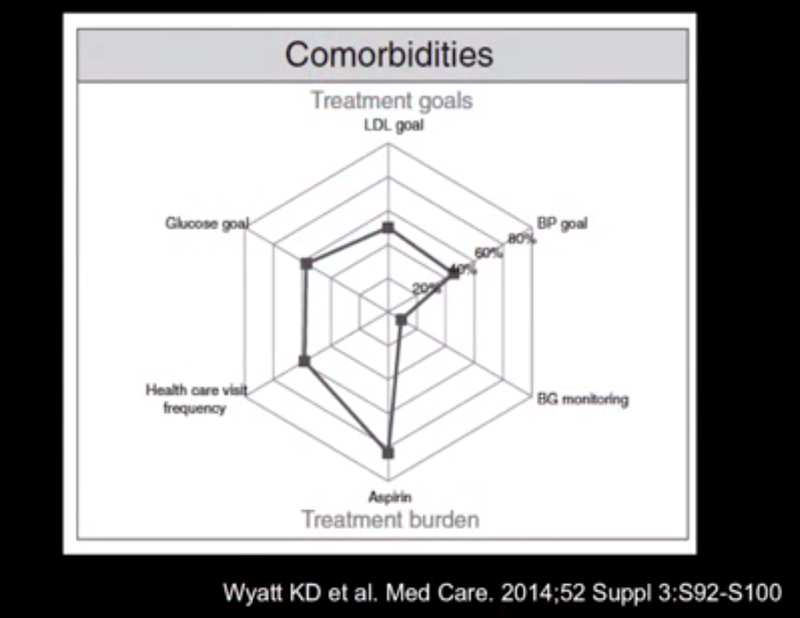 …But this is how much the guidelines took into consideration other aspects of the Patient context. In this case social and personal context. Nah. 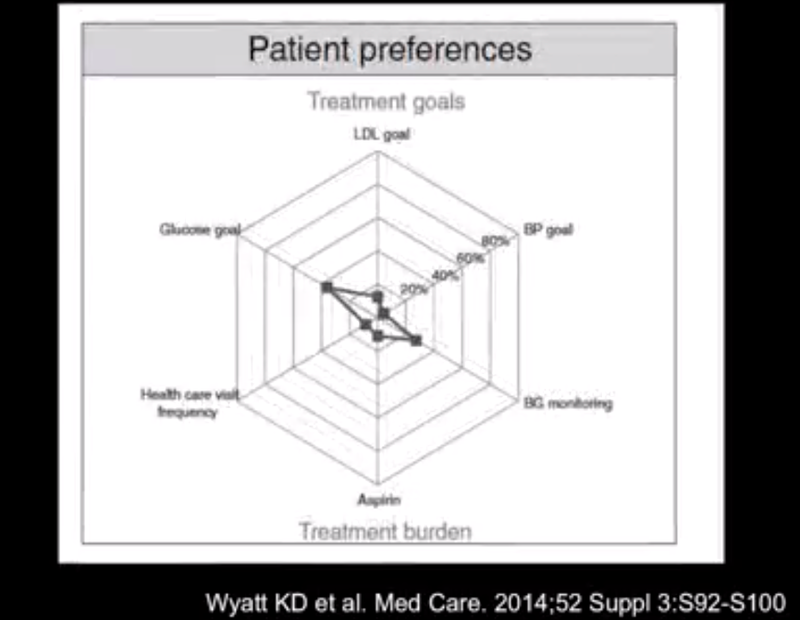 …How about Patient preferences? Nah forget about it. 14 Responses to Does ‘John’ need your time or attention?